Las Bahías de Huatulco (The Bays of Huatulco) is this resort’s full name; there are nine bays in total and among them they are host to thirty-six attractive beaches featuring soft sands and crystal clear blue waters off the Pacific coast in Mexico’s state of Oaxaca. Situated about 430 km (270 miles) southeast of Acapulco on Mexico’s Pacific coastline, Huatulco is a relatively-new resort area with well-preserved natural surroundings and eco-centers coupled with highly appointed accommodation and good facilities to repair to in the evening. This is not the place to stay if you’re on a tight budget, but neither will it cost as much as the exclusive resorts along Costalegre, further up the Pacific coast. 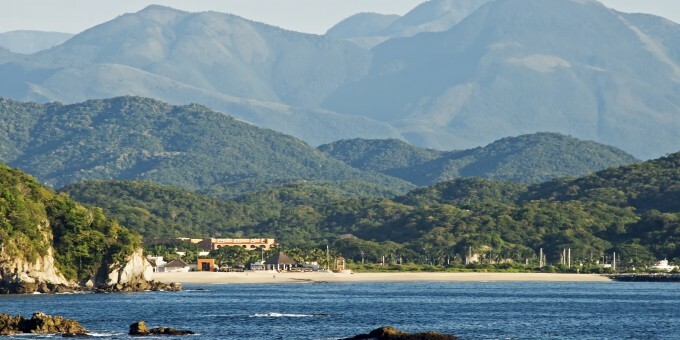 Huatulco’s commercial beach resorts are not a high-rise commercial cousin to Cancun. Instead, space has left between building projects and areas for development are being carefully selected to minimize the impact on the environment; for example, hotels and other buildings cannot exceed six stories in height. There are nine bays in total and Huatulco is divided into three distinct areas: Crucecita, Santa Cruz, and Tangolunda. Some of the bays are unsuitable for development as the shoreline is too rugged and the undertows too strong along some beaches. Tangolunda Bay is the best developed; it has well-established resorts and a well regarded 18-hole golf course. Huatulco is being carefully managed to cater to those people who are looking for a higher quality resort experience with less of a “manufactured” feel, and without driving customers to the ultra-exclusive end of the market, like those in Costa Alegre and Punta de Mita. A vacation in Huatulco will most usually revolve around relaxation, eco-tourism, and a few of the less taxing water sports like snorkeling and localized sailing. Although some limited night life is available here, Huatulco is not intended as a mecca for night-revelers. So if your body and soul is craving some serious beach therapy that is more relaxed and quieter than the most popular beach resorts, but you don’t want the up-market exclusive privacy and quiet that comes with Mexico’s ultra-luxury resorts, consider relaxing on the shores of Huatulco’s bays. Stroll across soft sands and gaze out across crystal clear blue waters of the Pacific Ocean on Huatulco’s beaches. Many of them have bars and restaurants on them, so you can spend time sun bathing, swimming, snorkeling and not be more than a stone’s throw away from your next delicious meal or a thirst quenching refreshment. Snorkeling is the main attraction around Huatulco; snorkeling equipment is available for rent locally. River rafting on local rivers is also a popular sport in this part of Mexico. The bays and beaches are a main attraction in Huatulco, and there’s no better way to see them than to take a cruise along the shore in the local area. Tours include stops at great places to swim and snorkel and some stop at local beaches for lunches comprising of fresh, locally caught fish and other seafood. Check at your hotel or ask at the local port in La Crucecita or Santa Cruz for information about cruises. You can take a commercial tour (on a large boat) or hire a small boat and boatman privately by the day or by the hour so you can go where you want at your own pace. Huatulco is a great place to go if you’re looking for an authentic adventure tour. The region offers a wealth of topography, areas of natural beauty, scenery and facilities that make adventure holidays around here an absolutely stunning experience. The surrounding mountains and jungle also make Huatulco a great base from which to take ecological tours in the area. By Air – Huatulco is not as accessible as other coastal areas in Mexico; perhaps one of the reasons why it is as yet less visited than other places. You can get to Huatulco by airplane from the Europe and the USA connecting via Mexico City. Some local air carriers run local flights from Oaxaca, in-season (check locally). The airport is quite close to Huatulco on the northwest side, and a private taxi will take you to your destination. The three main towns around the Bays of Huatulco are Crucecita, Santa Cruz and Tangolunda. Crucecita is the closest and Tangolunda is the farthest away. Your hotel can arrange return transport for you. For detailed information about flights and flying, see the Mexperience guide to Air Travel in Mexico. By Bus – You can travel to Huatulco on a bus from Mexico City. Bus services are also available from Oaxaca, Acapulco and Puerto Escondido. The bus will leave you in a town nearby called Crucecita (“Little Cross”). From there you can get a taxi or ground transportation to your hotel or resort Huatulco. See the important information about the roads to Huatulco below. For detailed information about bus transportation read the Mexperience guide to Bus Travel in Mexico. By Car – Highway 200 runs south along the coast from Acapulco. The road is well maintained but is mountainous and winding. There is no lighting, either, so we recommend you drive the 200 only drive during daylight hours. There have been some reports of car-jacking on this remote highway; however the authorities, mindful of the importance of tourism, ramped-up the number of police and military patrols along the route and thus dramatically reducing the reported incidents. Highway 175 from Oaxaca City to Huatulco will take about 8 hours to cross: the road is mountainous and, although the scenery is spectacular, it’s a hard and tiring drive. For security reasons, we recommend you travel this road in daylight hours only, whether you go by car or by bus. See additional information about Driving in Mexico and Mexico’s Toll Roads on Mexperience. Car Rental – To explore Mexico’s provincial towns and cities—including its beach locations and the scenery and attractions near them— consider renting a car for your visit. Having your own car will give you more flexibility than using public transport options and, in some cases, offer you access to places which are otherwise difficult to visit without the use of a car. Read our guide to Car Rental in Mexico to learn what you need to know about car rental in Mexico and connect to the Mexperience Travel Center to reserve your Rental Car. Taxis – It’s a bit too far to walk between the three main towns, but taxis are plentiful and very reasonably priced. Taxi travel is very affordable in Mexico, in comparison to the USA, Canada and Europe, and so provides a viable means of public transportation in Mexico. Your hotel can arrange taxis for you; some post their rates on a board in the lobby; taxi hotel rates are usually higher than cabs you hail off the street. If you speak Spanish, you will have a distinct advantage and be able to negotiate a price with the driver. For detailed information, read the Mexperience guide to Taxi Travel in Mexico. Local Buses – Local mini buses run between the three towns and if you’re not weighed down with items you’re carrying, and you’re not in a huge hurry they’re great value as they cost a small fraction of the cost of a taxi. Public Transport is Limited – Public transport is limited in this area, so consider a rental car if you want to explore the surrounding bays and the magnificent scenery. No local events currently recorded. Exchanging Currency: Banks with ATM machines are found just around the corner from the main square (south side) in the town of Crucecita. During business hours, they and the Casas de Cambio will buy traveler’s checks and cash from you as well. For detailed information about exchanging and managing your money, read the Mexperience guide to Money in Mexico. Road Connecting Oaxaca City to Huatulco: Highway 175, which is the connecting road between Oaxaca City and Huatulco is remote, rugged, and very mountainous. For security reasons, if you travel this road, whether by car or by bus, we recommend that you travel during daylight hours only. A tolled highway connecting Oaxaca City and Huatulco, which will provide an alternate route to the Pacific is being constructed. When it opens it will transform the road journey from Oaxaca to the Pacific Coast in this region. Huatulco’s Night Scene – Much less developed than that of its closest “resort” neighbor, Acapulco. However, night life is available for those looking for a place to party, swing and dance until the sun comes up. New venues are appearing all of time. Nightclub Scene – Nightclubbing is becoming an ever-increasingly popular pastime among holiday makers in Huatulco, which is driving up the supply of quality nightclubs and bars. Some night clubs charge an all inclusive cover fee; some a smaller cover and drinks on top. Drinks are served all night – don’t even consider going to a nightclub until about 11pm. Nightclubs keep going all morning and people will start to leave at around 5 or 6 am. Night Bars / Restaurants – All over Huatulco there is a selection of local, national and international names in late night entertainment. You’ll find local shops and outdoor markets in Santa Cruz and Crucecita that cater to the holiday shopper hoping to bring back a bit of Mexico. The markets offer you the opportunity to buy some locally made arts and crafts—including locally made traditional clothes and the famous pottery made from Black Clay, synonymous with Oaxaca (the State in which Huatulco resides). Huatulco is hot and humid year-round. The rainy season is May to October, but as with most monsoon areas, rains tend to be fierce and brief in the late afternoon, leaving the evenings dry and cooled off. September brings the highest levels of humidity and sees the heaviest of the rains.